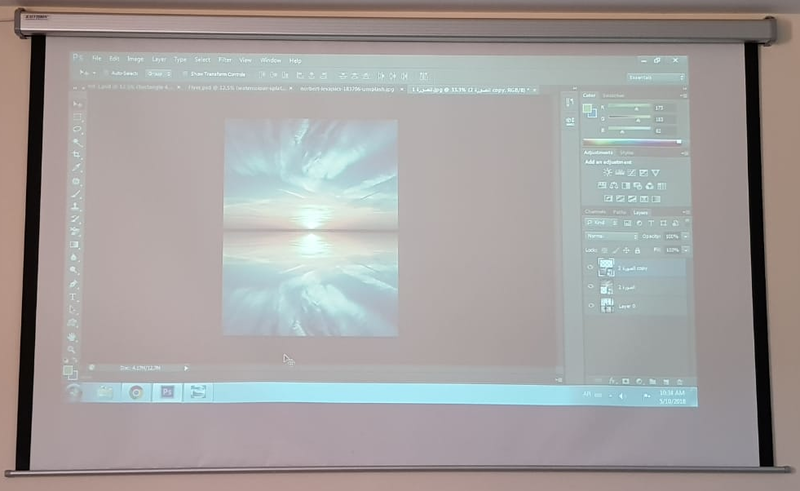 In the context of experience exchange and cooperation between the Deanship of Admission and Registration and the Deanship of Preparatory Year for Medical Path (female section), the Deanship of Preparatory Year for Medical Path organized the “Photoshop Basics Course.” This was on Thursday, Sha’baan 24, 1439 AH, at its headquarters in Al-Abdeyyah. The course was given by Ms. Hanaa Al-Tuwairqi, one of the affiliates of the Public Relations and Media Unit at the Deanship of Admission and Registration. Ms. Al-Tuwairqi explained the basics of the software. She started with creating new action, as well as inserting and merging images and shapes. Then, she moved to writing and saving. Finally, some exercises were implemented and queries were answered. At the end of the course, Her Excellency Dr. Azzah bint Muhammad Bannunah, Vice Dean of Preparatory Year, expressed her thanks and appreciation to the Deanship of Admission and Registration for accepting the invitation to carry out the course, and promoting cooperation between the two deanships, which would improve and develop performance, in order to achieve the Saudi Vision 2030.